Gamers - This is the app designed by gamers, just for you. If you ever get frustrated when you miss an in-game event, try to play when the server is down, or miss a sale on those resources you desperately need, then GamerCal is what you've been looking for. GamerCal is designed to help you never miss an advantage and beat out the competition. 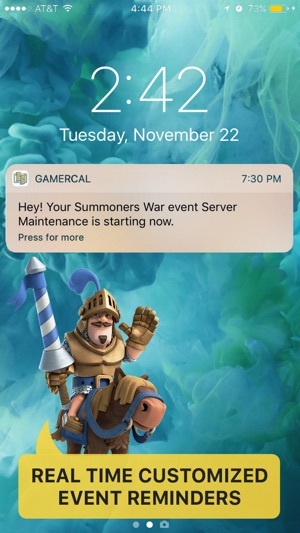 GamerCal notifies players when limited time offers, sales, in-game events, server maintenance, and more are occurring across all their favorite mobile games. 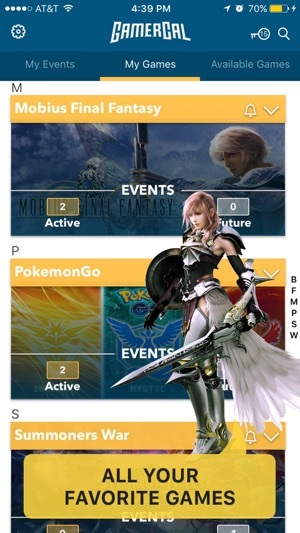 Pick your favorite games, select the events you care about, when you want to be notified - and GamerCal does the rest! In v1.5 we are also now helping you track your favorite Twitch streamers! Get alerts when they are about to go live and never miss a moment. 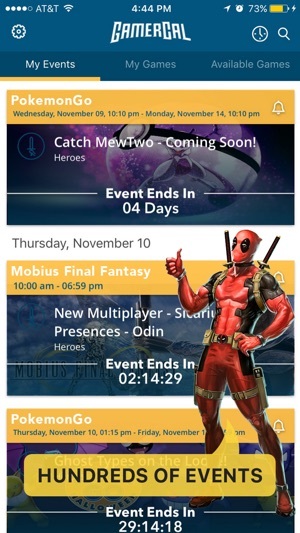 Download GamerCal today to track your favorite game's events and maximize your gameplay. Never miss an advantage! Are we missing one of your favorite games? 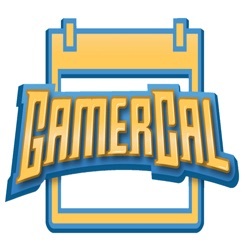 Visit www.gamercal.com to submit your favorite game so we can add it to our list! 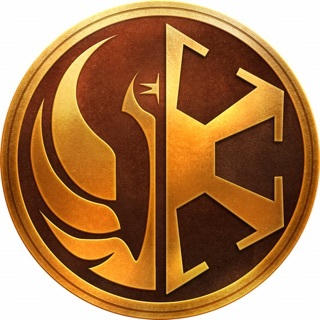 All characters, names, images, etc… are property of the respective game titles. This app is intended for entertainment purposes only. BIG UPDATE! We have added the ability to easily identify and follow your favorite streamers on GamerCal. 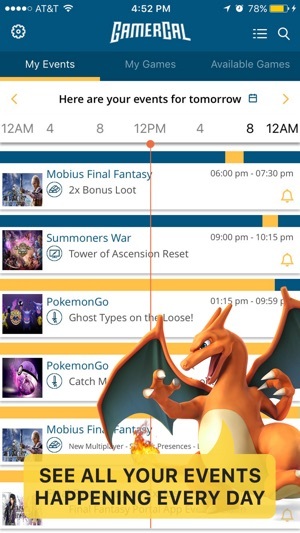 Get reminders of when they are going live and catch them playing your favorite games, all within the app. Happy streaming! Honestly, kinda cool to finally find an app like this, but there’s only a handful of games it supports. Also added a game to my list because I sometimes play but not as much as I used to. Since I can’t turn off notifications for individual games, I tried to just delete it from my games. The “My Games” list had the option to hide the game but the game events still show, and now I can’t find a way to put the game back where it was. Had to just delete the app because I didn’t want notifications for that game. Hi Shrillss, thanks for the suggestion regarding the My Games tab, we are working on it for our next version. Also, there is a capability to turn notifications for a game on/off - the bell in the top right. Please feel free to reach out to us if you have any more feedback, we are looking to build the best possible app for you and the rest of the gaming community! Exactly what I've been looking for. 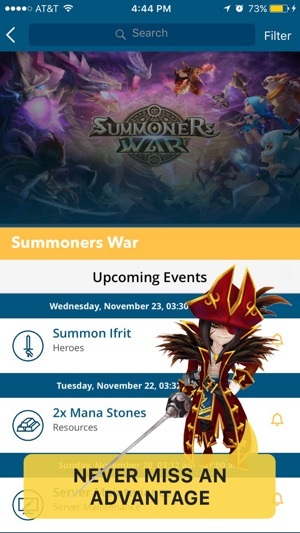 I kept missing events and sales in Wonder Tactics, PokemonGo, and Clash Royale. With this app I can make sure to get reminders for everything I need. Very excited to see where this goes, GamerCal rules! Found online. This is hella dope! I mostly play PC but found an article about this and thought I'd check it out. Super easy to use and been helping me a lot so far!